The alate and can be identified to species. Abdominal tergite VII of the Dysaphis crataegi alate never has paired marginal tubercles (cf. Dysaphis apiifolia, alate which usually has paired marginal tubercles on abdominal tergite VII). 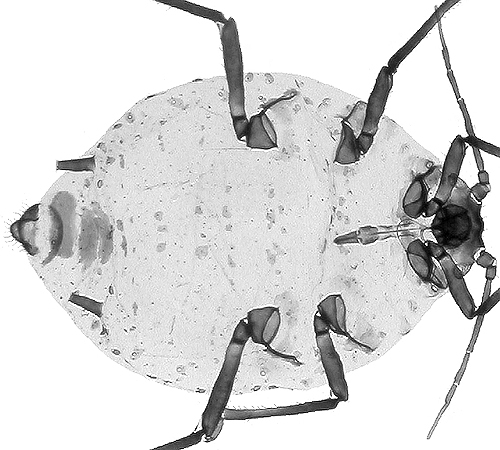 The total number of secondary rhinaria on the 5th antennal segment of Dysaphis crataegi (adding both sides together) is usually 0-3 (cf. Dysaphis angelicae which has more than 9 secondary rhinaria on the 5th antennal segment). 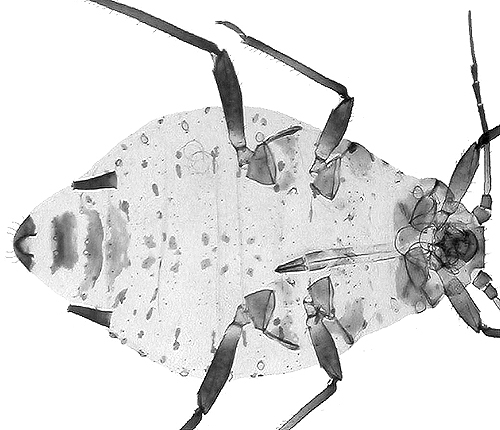 The longest hairs on the third antennal segment of Dysaphis crataegi are 6-19 µm. (cf. Dysaphis lauberti which has the longest hairs on the third antennal segment at 14-35 µm). 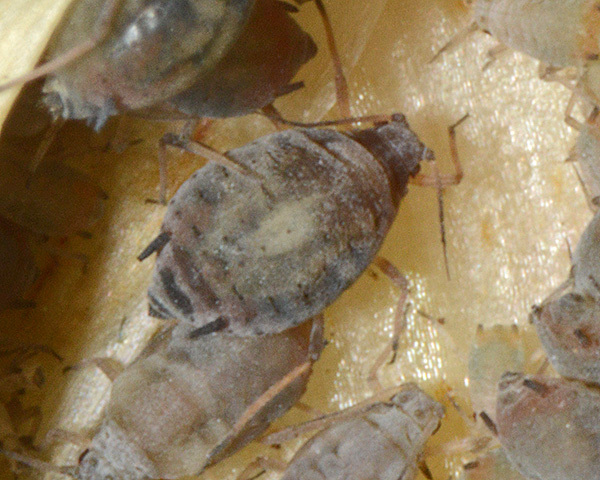 Apterae on the secondary host (see second picture above) are yellowish grey or greenish grey and lightly wax powdered. 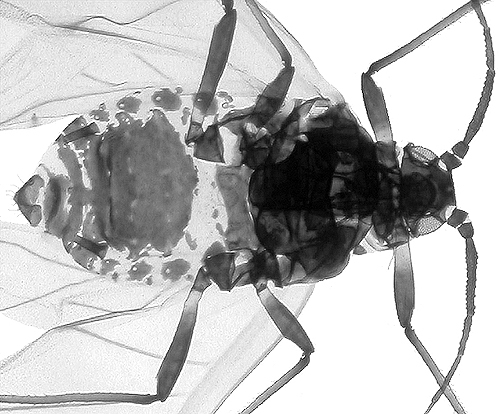 The longest hairs on abdominal tergite 8 are again usually >30 µm in length. 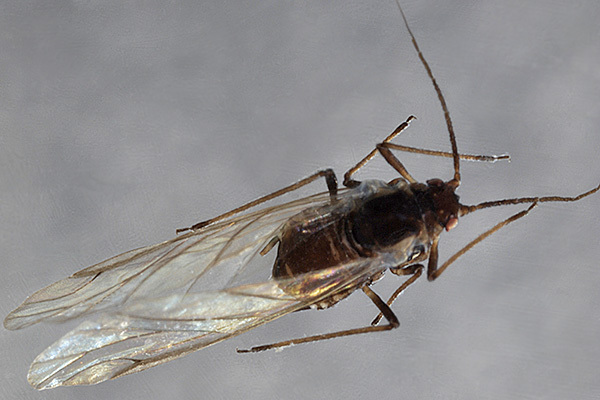 The micrographs below show (1) an emigrant alate and (2) an adult aptera on the secondary host (both in alcohol). The oviparae are reddish brown with strongly swollen hind tibiae, and the alate male is reddish with a black pigmented pattern. The clarified mounts of Dysaphis crataegi below show (first) the fundatrix on hawthorn, (second) the spring migrant alate, and (third) the aptera on its secondary host. 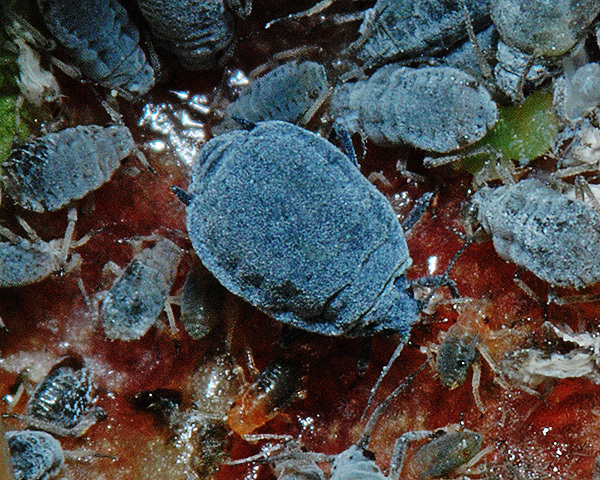 The hawthorn-carrot aphid comprises a group of closely related subspecies. They all have hawthorn (Crataegus spp.) as the primary host, where they cause deep cherry-red curled-leaf galls in spring and migrate to umbellifers (Apiaceae) in summer. The secondary host depends on the subspecies involved. In western Europe Dysaphis crataegi crataegi migrates to wild carrot (Daucus carota) or sometimes to cow parsley (Anthriscus sylvestris), Dysaphis crataegi kunzei migrates to wild parsnip (Pastinaca sativa), and Dysaphis crataegi aethusae migrates to fools parsley (Aethusa cynapium) and to hedge parsley (Torilis spp.). There are two further subspecies in Asia. As well as the various subspecies of Dysaphis crataegi detailed above, there are also several other hawthorn-feeding host-alternating 'full' species which are difficult to distinguish from Dysaphis crataegi. These include Dysaphis angelicae which migrates to wild angelica (Angelica sylvestris), Dysaphis apiifolia which migrates to parsley (Petroselinum) and sometimes to other umbellifers, and Dysaphis lauberti which migrates to hogweed (Heracleum). The cherry red galls of Dysaphis crataegi and related species (see pictures below) can be found in spring on hawthorn over most of Europe. 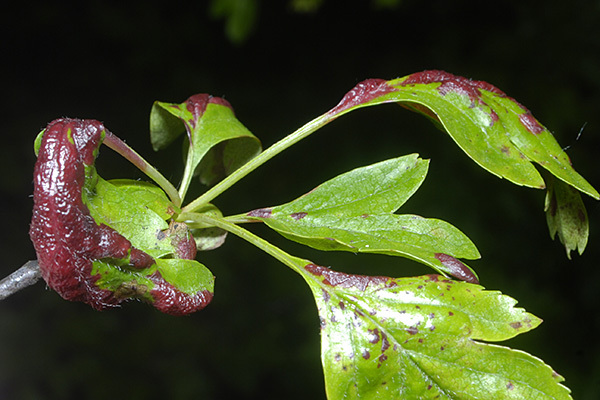 It is not uncommon to find several leaves affected in the same sprig of hawthorn, as shown in the second picture above. 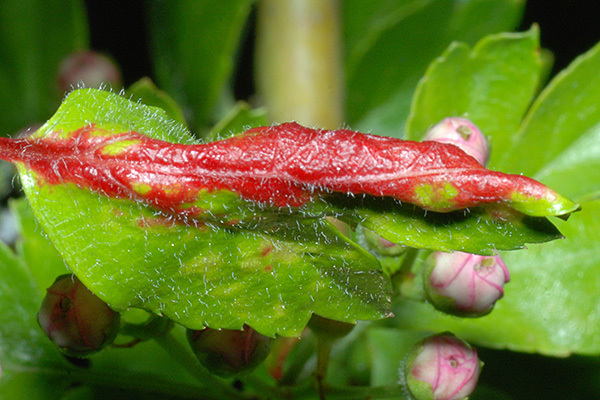 The galls clearly provide a degree of protection to the aphids living within them. 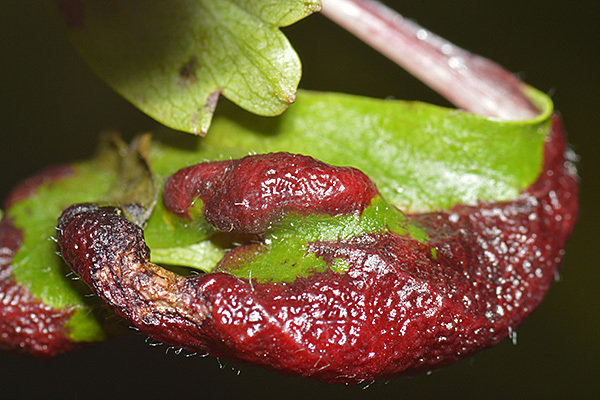 It is not uncommon to find predators inside the galls of Dysaphis crataegi. 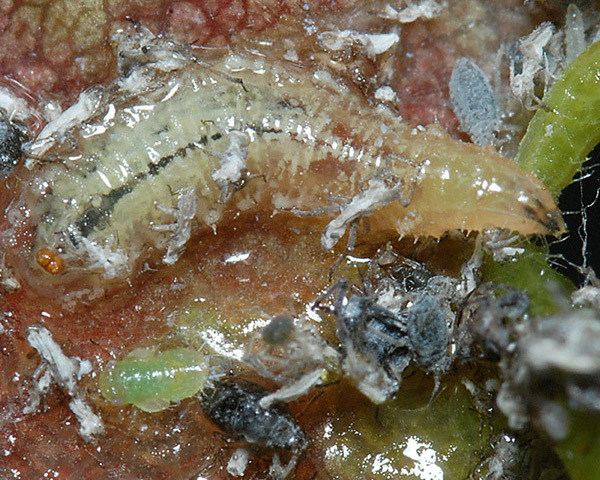 The picture below shows a syrphid larva (possibly Melangyna) feeding on Dysaphis crataegi within the gall on the primary host. 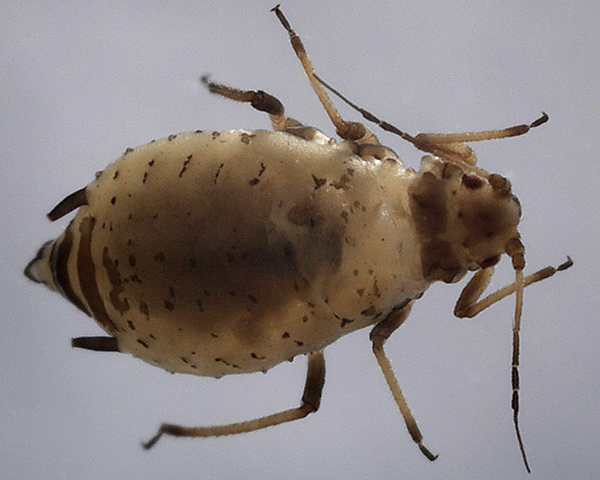 We have identified the aphids below living on wild carrot (Daucus carota), cow parsley (Anthriscus sylvestris) and hemlock (Conium maculatum) as Dysaphis crataegi using the keys of Blackman (2010). However, since we only examine whole mounts in alcohol - not clarified mounts - these identifications should be regarded as only provisional. Both the pictures below show Dysaphis crataegi on wild carrot (Daucus carota). 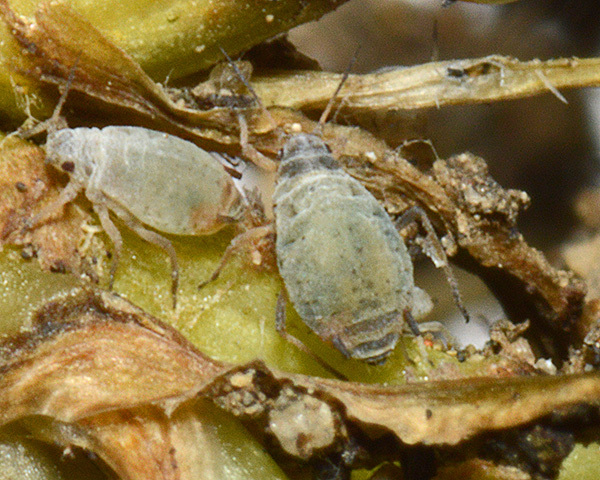 Note that the orange patches around the bases of the siphunculi are much less clearly marked on the adult aptera (the larger of the two aphids below) than on the immature, although it is still visible. Dysaphis crataegi are commonly attended by ants on the secondary host. 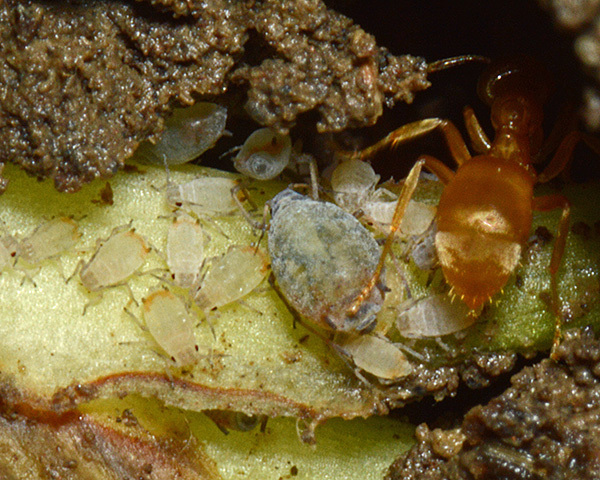 The ants usually construct earthen shelters over the aphid colonies. The picture below shows a colony on wild carrot attended by Myrmica ants. 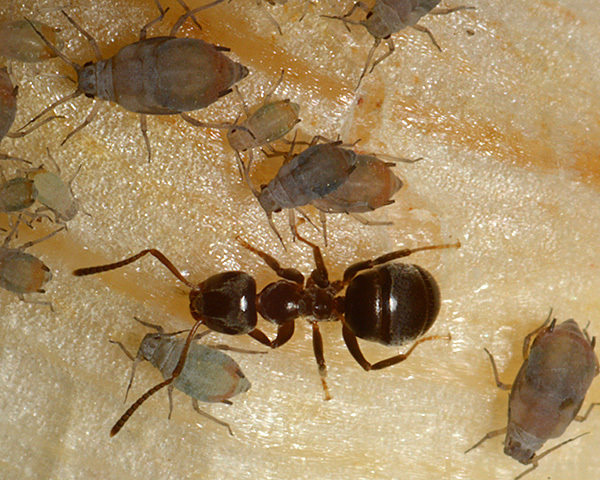 Lasius ants may also be found attending Dysaphis crataegi on the secondary host. The picture below shows a Lasius ant attending Dysaphis crataegi feeding on the root base of cow parsley (Anthriscus sylvestris). 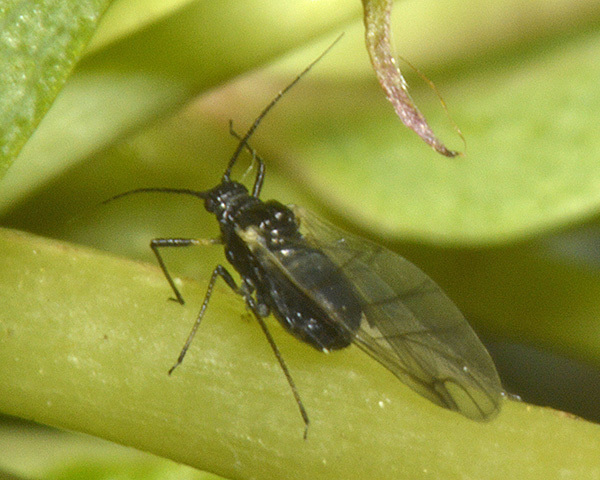 Szwejda & Wrzodak (2007) list Dysaphis crataegi as one of the insect pests causing significant economic losses to carrot crops. Kuczak (2009) compared the occurrence of carrot pests on seven different carrot cultivars. Dysaphis crataegi was found on five of the cultivars. The cultivars Nantejska and Kalina F1 were the most preferred, with 30 and 74 individuals per plant respectively. Jankowska & Wojciechowicz-Zytko (2016) looked at the effect of intercropping carrot with two aromatic plants, coriander and summer savory, on the population density of selected carrot pests. A significantly higher number of roots infested with Dysaphis crataegi was recorded in plots sown with carrot as a monocrop only compared to intercropped plots.